Beware of fake Buddhist monks! 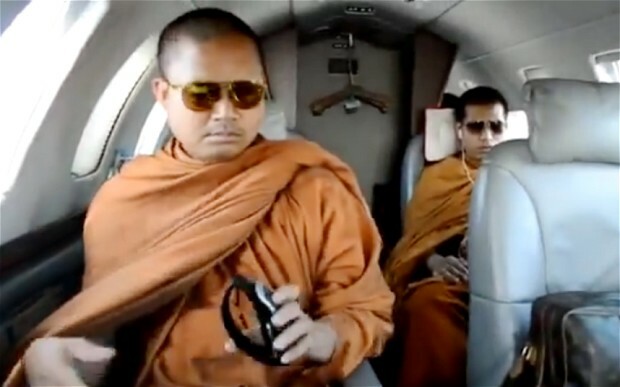 Luang Pu Nenkham Chattigo, the flamboyant abbot of Khantitham Forest Monastery has attracted attention ever since a video of him flying on a private jet, while wearing aviator sunglasses and carrying a Louis Vuitton bag went viral. Buddhist monks are supposed to stay celibate. However the 34-year-old abbot of the Khantitham Forest Monastery who has fathered 2 children is apparently married to a woman named Yupinpraethong Janthawa, and has allegedly had relationships with 8 other women. The abbot was accused of being a fake monk and of committing fraud by wearing monk’s robes he is not entitled to. Posing and dressing as a monk is a criminal offence in Thailand. The complaint was filed at Bangkok’s Criminal Court by Luang Pu Buddha Isara, the abbot of another monastery. The cleric is now the subject of a joint investigation by the DSI and the Office of National Buddhism, which oversees Thailand’s 200,000 monks. He is also at the centre of a money-laundering investigation. Police Colonel Pong-in Intarakhao claim the abbot and his associates had 41 bank accounts, mostly in his name, and that he is believed to own two houses and 13 cars and motorbikes. Much of the cash in the accounts is believed to have come from public donations to his monastery in the northeastern province of Si Saket. While scandals involving monks taking drugs, gambling and driving around in expensive cars are not uncommon, the extent of Luang Pu Nenkham’s alleged misdeeds has shocked Thailand, which has the world’s largest Buddhist population. The abbot, who claims to have walked on water, is believed to be travelling in Europe. Did you know that Thailand leads the way when it comes to… Would you pay US $1,100 for a kilogram of elephant dung coffee?